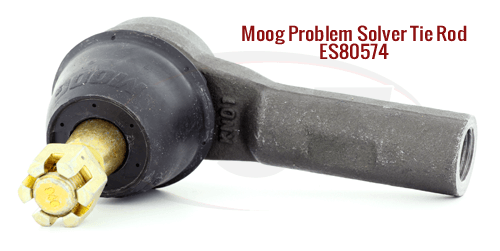 Moog's problem solving tie rod end ES80574 is designed to exceed the OE expectations: allowing for easier installation and a much longer life, especially with fleet and commercial applications. 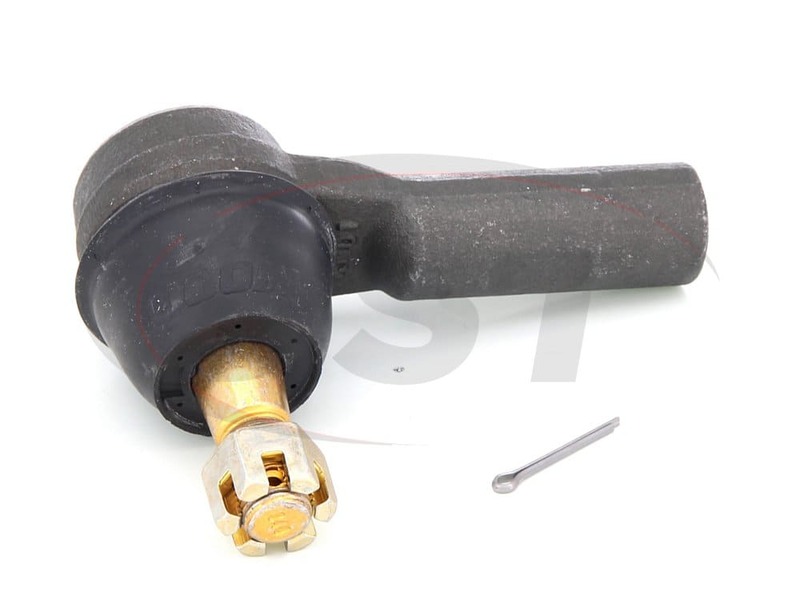 Moog's problem solver parts, like this ES80574 tie rod end, target factory defects or poor original design, replacing them with a more durable and easy to install part. 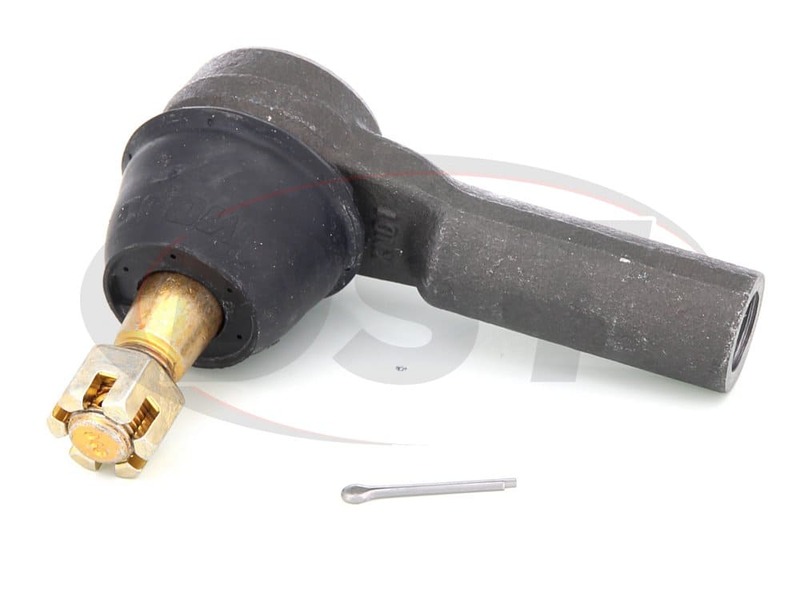 For the outer tie rod ends on the 06-10 Dodge Ram 1500 it is especially important. Did you know that your Ram 1500 had an aluminum knuckle? Whether you knew that or not, you probably didn't know that your outer tie rod ends have very specific design requirements to prevent damaging your aluminum knuckle. 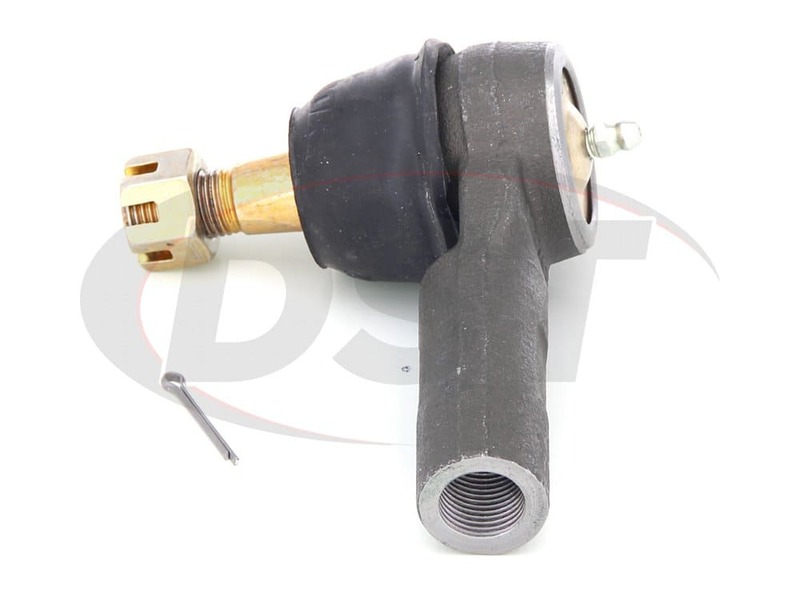 When choosing a replacement tie rod end, it is very important to use a part that matches these requirements to avoid using a flawed part like the OE one. 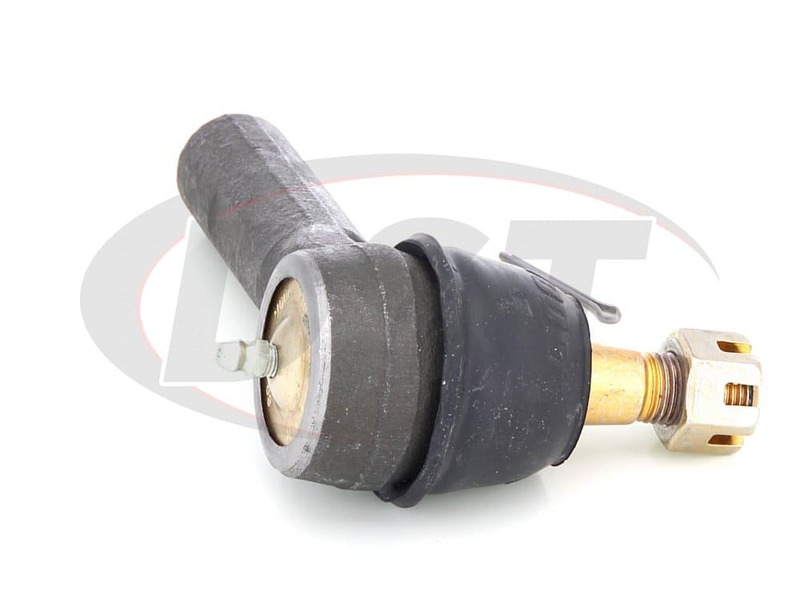 The OE tie rod requires a coated stud to prevent corrosion and uses a plus-minus 27-degree range of swing. In addition, the use of a plastic bearing and a lack of preload in the OE part have led to accelerated wear and early failure when these trucks are put to the test. 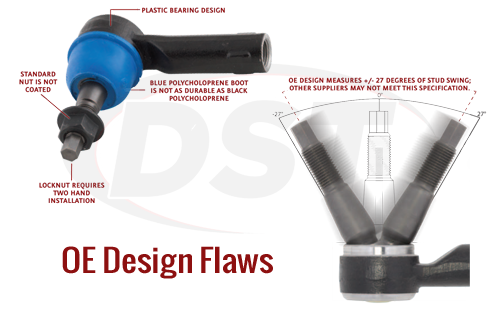 Many aftermarket suppliers' replacement does not have the needed range of stud swing, making the part inefficient. Also, the blue polychloroprene boots, which many suppliers use, are not as durable as the black. Once the boot is torn or ripped off, the stud is exposed to harmful contaminants that can rust or destroy the stud. OE parts and other supplier's parts have failed with this design, especially for trucks that are used for commercial or fleet purposes. 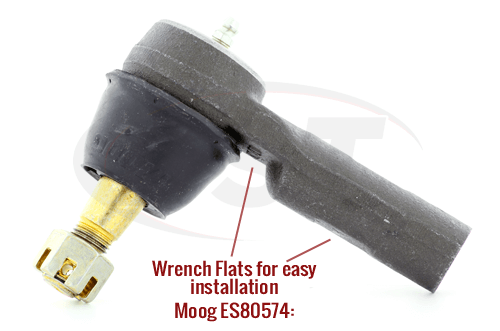 Moog's problem-solving tie rod end ES80574 is designed to exceed the OE expectations: allowing for easier installation and much longer life, especially with the fleet and commercial applications. 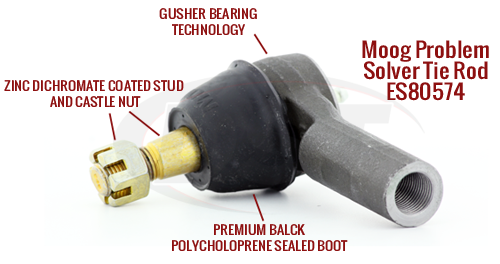 Moog's tie rod features a gusher bearing instead of the plastic bearing, providing added durability and increasing the life of the stud. The stud is a full-ball metal stud which exceeds the stud swing OE specifications, preventing any stud to housing impact damage. Also, the stud features a zinc dichromate coating to prevent galvanic corrosion, which is common when metal contacts aluminum. The ES80574 is a greaseable design and includes the zerk grease fitting to flush out harmful contaminants and keep the part lubricated. Helping to make sure the part stays lubricated is the black polychloroprene sealed dust boot. 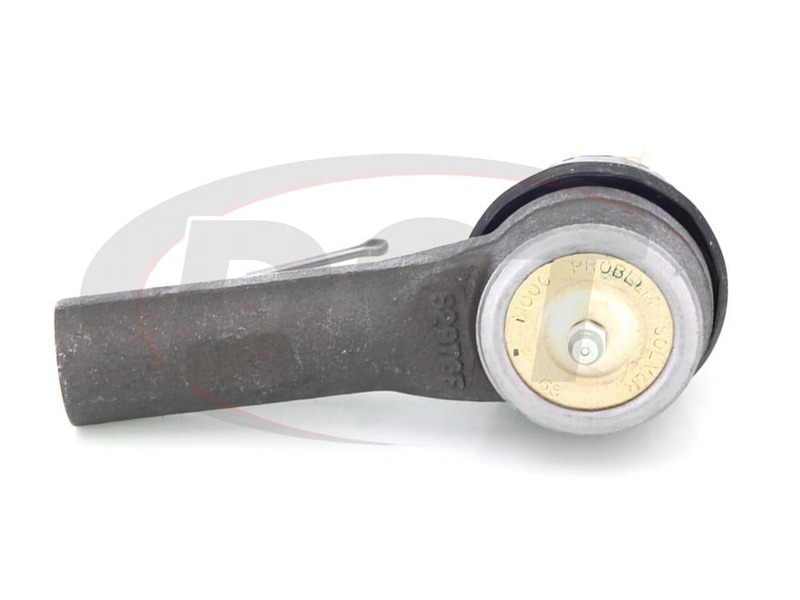 Moog has engineered this tie rod with their patented dome cover plate and Belleville washer to ensure the proper preload and consistent socket torque. The coated castle nut, combined with the wrench flat makes installation and alignment much easier than the OE or other replacements. All of Moog's problem solvers are backed by a lifetime warranty that can be handled directly through DST. I love Moog parts and they hold up great yet I believe there is an issue with the boot. Ive had to replace the tie rod ends twice already due to the boot tearing causing all the grease to leak out. Not Moogs fault just a fault in the integrity of the boot. 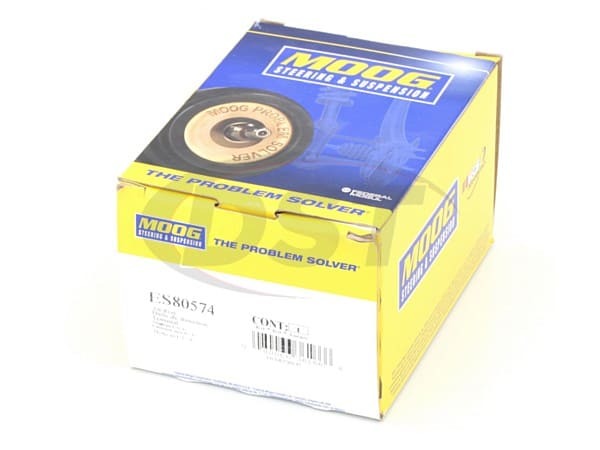 Editors Note: Most Moog grease dust boots fail because of over filling with grease or using a pneumatic grease gun. On most Moog dust boots they have a grease relief made into them.  Even with the grease relief they will split if it is not clear. Another problem is debris or off road driving. Tie rod end seems to be built very well. The thread on the grease fitting is 1.25 x 28. I cant tell by the picture can you grease this part? Yes, part number moog-es80574 is greaseable.